Allegro® Industries, Gas Powered Ventilation Blower-SubaruAllegro® Industries, Gas Powered Ventilation Blower-Subaru, Item # 9505, Perfect for remote locations where electricity is unavailable, this gasoline-powered, 3 1/2 hp blower offers high flow rates. 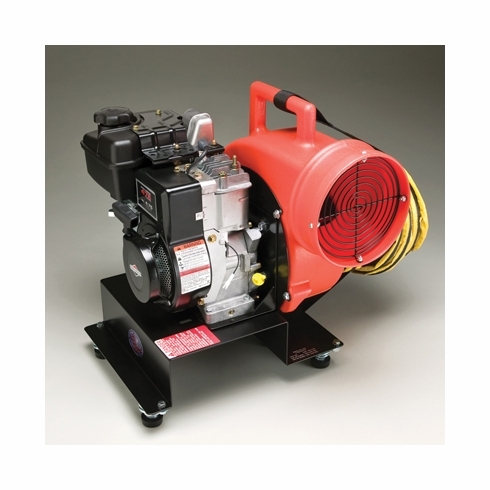 Perfect for remote locations where electricity is unavailable, this gasoline-powered, 5.7 hp blower offers high flow rates. The 8” ports and steel guards provide safety and the polyethylene housing with built-in handle offers durability and convenience. It is designed with a sturdy metal base that minimize blower rocking and offers greater stability. 3.5 quarts of gasoline will power 3-4 hours of running time. Blower includes 6 foot inlet hose extension. Smart compact design allows for easy use and storage without sacrificing airflow. Two 8" (20.3cm) ports offer positive ventilation or fume extraction.